The Retail Sales Upward Revisions will likely add a couple ticks to second quarter GDP, but overall growth still remains very weak. The retail sales revisions may add another 0.2% or so to second quarter, assuming there are no other changes. That's a huge assumption given the history of revisions in nearly every economic number. Those hoping retail sales will give a huge boost third quarter GDP are likely mistaken. 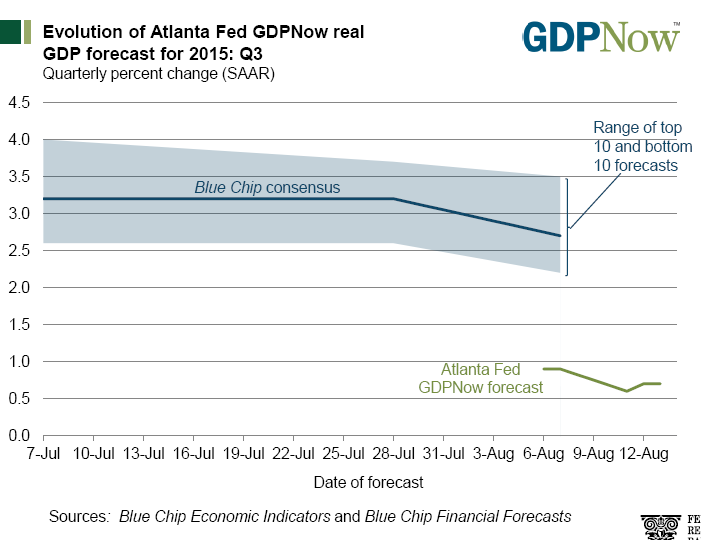 The Atlanta Fed GDPNow Forecast for this quarter stands at an anemic 0.7%, down from the initial reading of 1.0% made on August 6. 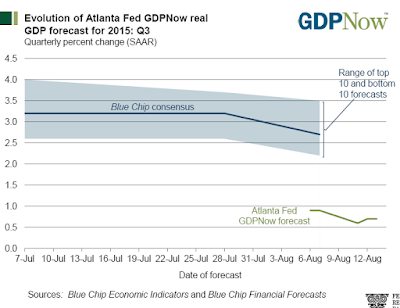 The GDPNow model forecast for real GDP growth (seasonally adjusted annual rate) in the third quarter of 2015 was 0.7 percent on August 13, down from 0.9 percent on August 6. The previously reported nowcast of 1.0 percent for August 6 was revised down due to a minor adjustment in the method for nowcasting investment in computers and peripherals. Since a week ago, the nowcast for the contribution of inventory investment to third-quarter real GDP growth has declined from -1.8 percentage points to -2.2 percentage points. This decline more than offset an increase in the nowcast of the third-quarter growth rate in real consumer spending from 2.9 percent to 3.1 percent after the release of this morning’s retail sales report from the U.S. Census Bureau. Let's mentally bump up second quarter to 2.5% leaving everything else as reported or estimated. The average growth through three quarters would roughly be a very weak 1.27%. And the Fed is going to hike interest rates smack into that weakness.